Director Guillermo del Toro has confirmed that he and X-Men: The Last Stand scribe Zak Penn have been penning the sequel to Pacific Rim 2 in "secret" and how they "found a way to twist it around." While we've heard earlier this year that a sequel to sci-fi flick Pacific Rim was just a possibility and not certain, that hasn't stopped director Guillermo del Toro from writing a screenplay for it already. In an interview with BuzzFeed, Guillermo del Toro has confirmed that he, along with Zak Penn (X-Men: The Last Stand, The Incredible Hulk), are no penning the screenplay for Pacific Rim 2. I'm working very, very hard with Zak Penn, We've been working for a few months now in secret. We found a way to twist it around. Travis Beacham was involved in the storyline and now I'm writing with Zak because Travis has become a TV mogul. Del Toro clarifies that Legendary Pictures has not formally agreed to finance a sequel, but that he and Penn are proceeding with the assumption that it will be made some day, stating, "I don't have the money, but I'm proceeding like it is happening." Regarding the plot of the sequel, del Toro squashed all rumors of it being a prequel, and added that characters Raleigh Becket (Charlie Hunnam) and Mako Mori (Rinko Kikuchi) will indeed be returning, with the story following the events of the first movie. Some people were wondering if we were going to do the prequel. I was never interested in doing that first wave of invasion...I'm going for very new, very crazy ideas on the second one, which are very different from the first one - but you will get really great spectacle. 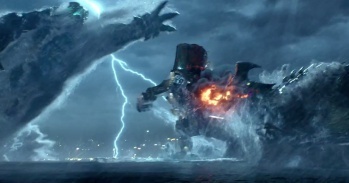 While Pacific Rim didn't set the domestic box office on fire as some thought it would, it did fare well internationally raking in over $309 million during its theatrical run. Would you watch Pacific Rim 2? And what changes would you want to see happen in the sequel if it ever happens?